The conference will provide a forum for the exchange of scientific and technical information between industry, academic institutions and research organizations, on a broad range of current and emerging research areas of pulsed power technology and application, high power micorowave and RF sources, radiation sources and particle beam technology. Beside basic research the conference will feature the technology, the applications and the commercial opportunities of pulsed power technology, and will address both the state of the art of current and future trends. We welcome your attendance and look forward to your participation at the 5th EAPPC Conference in Kumamoto, Japan. Online Registraton site has been opened. Please complete your registration by August 1, 2014 to receive a benefit of discount rate. Reception of abstract submission was closed. Number of abstracts exceeds 180, which is more than our expectation. Thank you all very much for your great contribution. 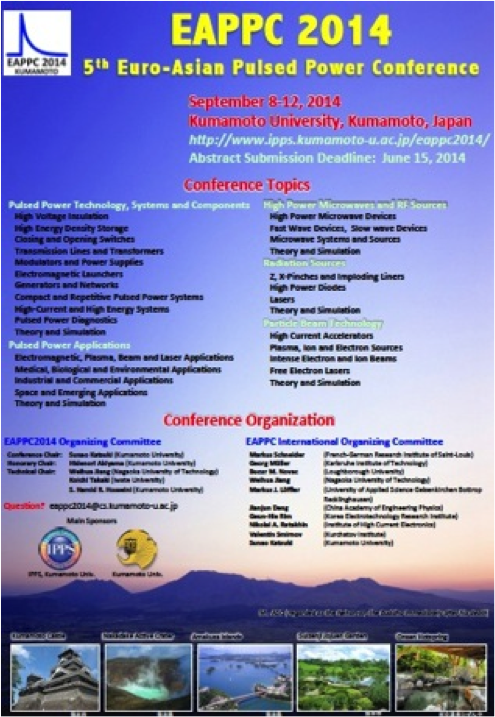 Send an email to eappc2014@cs.kumamoto-u.ac.jp for the post deadline abstract submission. Period of abstract submission was extended to June 30, 2014. Apr. 13, 2014 Technical co-sponsorship of IEEE Nuclear and Plasma Science Society (IEEE NPSS) was formally approved. Apr. 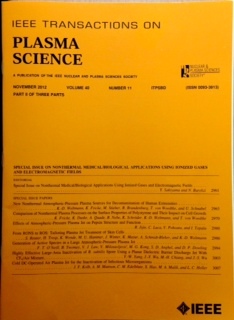 01, 2014 Information on the Special Issue for IEEE Transactions on Plasma Science was updated. Mar. 28, 2014 Tentative timetable of the technical program was placed. Mar. 08, 2014 Special Issue for the IEEE Transactions on Plasma Science is scheduled to be published after the conference. Mar. 08, 2014 Conference poster and flyer were uploaded. Nov. 11, 2013 This WEB site was opened. Send an e-mail to eappc2014 for the post-deadline submission. Last updated on July 1, 2014. Copyright©2014 Institute of Pulsed Power Science, Kumamoto Univ all rights reserved.